In 2014 the National Gallery of Art assumed stewardship of the Corcoran Gallery of Art’s world-renowned art collection, including a number of iconic paintings by American artists. The addition of these masterworks to the National Gallery’s historic American collection was transformative, allowing for an enriched and enhanced presentation of the history of American painting in the permanent collection galleries. (c. 1770–1772), follow in gallery 62 where Samuel Finley Breese Morse’s monumental history painting The House of Representatives (1822) also hangs. 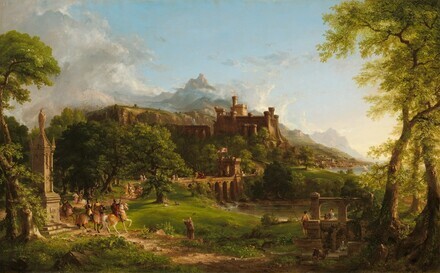 Although the Gallery’s Thomas Cole holdings were already exceptional, the collection did not contain an example of his paired paintings. In gallery 64, Cole’s The Departure and The Return (both 1837) now hang with other major works spanning the artist’s career. 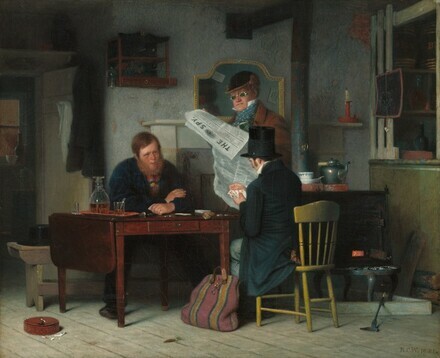 Four detailed and compelling genre scenes formerly in the Corcoran’s collection hang in gallery 65: Richard Norris Brooke’s A Pastoral Visit (1881), Richard Caton Woodville’s Waiting for the Stage (1851), Frank Blackwell Mayer’s Leisure and Labor (1858), and The Tough Story – Scene in a Country Tavern (1837) by William Sidney Mount. They are joined by George Caleb Bingham's Cottage Scenery (1845), a work that blends genre and landscape, and Charles Bird King’s intriguing trompe-l’oeil still life Poor Artist's Cupboard (c.1815). Gallery 66 is home to Augustus Saint-Gauden's Shaw Memorial, a monument to the Union Army's first African American regiment that fought in the Civil War. 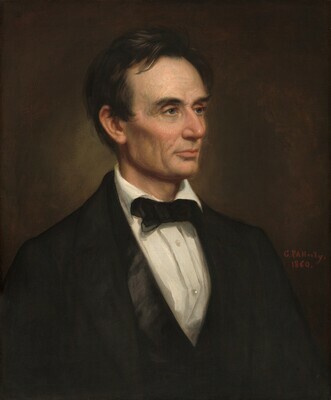 Two Corcoran Collection paintings sharing this connection to the Civil War hang nearby: George Peter Alexander Healy's portrait of Abraham Lincoln (1860), the first portrait for which the President posed following his election, and William MacLeod’s Maryland Heights: Siege of Harpers Ferry. 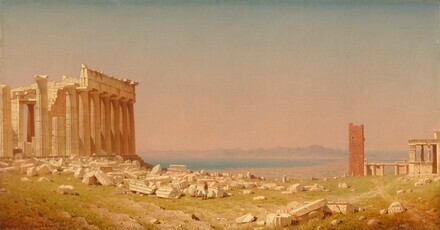 In Gallery 67, the integrated works demonstrate how American painters found inspiration in natural landscapes both at home, as with Frederic Church’s magnificent Niagara (1857) and Albert Bierstadt’s Buffalo Trail: The Impending Storm (1869), and abroad, as seen in Church’s tropical view, Tamaca Palms (1854), and Sanford Robinson Gifford’s Ruins of the Parthenon (1880). Gallery 68 is largely devoted to the National Gallery of Art’s significant Winslow Homer collection. With the addition of the late coastal scene A Light on the Sea (1897) from the Corcoran, a dozen important works by Homer spanning five decades of his prolific and varied career are on view. James McNeill Whistler’s atmospheric river scene Battersea Reach (c. 1863), also from the Corcoran, hangs nearby. Joining a suite of powerful portraits in gallery 69 are Thomas Eakins’s evocative Singing a Pathetic Song (1881) and John Singer Sargent’s regal likeness of Margaret Stuyvesant Rutherfurd White (Mrs. Henry White) (1883). 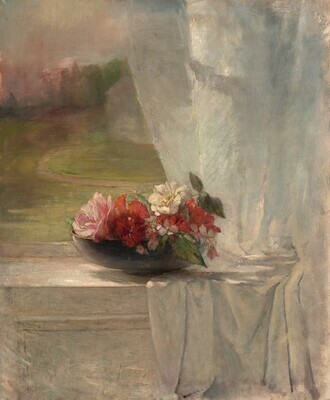 Two additional paintings by Sargent, the fishing village scene En route pour la pêche (Setting Out to Fish) (1878) and Simplon Pass (1911), a vibrant mountain view, hang in gallery 70 alongside John La Farge’s quiet still life Flowers on a Window Ledge (c. 1861) and Abbott Handerson Thayer’s luminous Mount Monadnock (1911/1914), all formerly in the Corcoran Collection. 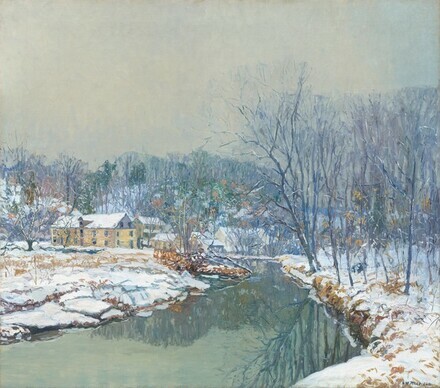 In Gallery 71, the last of the American painting galleries, Kenyon Cox’s Flying Shadows (1883), Daniel Garber’s April Landscape (1910), Edward Willis Redfield’s The Mill in Winter, (1921), and Willard Leroy Metcalf’s May Night (1906) offer four examples of impressionist landscapes with American subjects. Edmund James Tarbell’s Josephine and Mercie (1908), Gari Melcher’s Penelope (1905), and Daniel Garber’s South Room - Green Street (1920), all feature women subjects (often relatives of the artist) in domestic interiors engaged in activities including reading, sewing, writing, and embroidery. 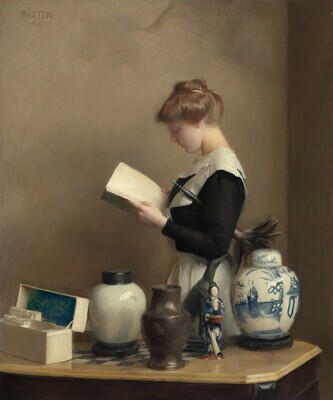 Many of these intimate paintings, along with William McGregor Paxton’s The House Maid (1910) and Alfred Maurer’s Young Woman in a Kimono (c.1901), also contain elegant still lifes of personal and decorative objects. 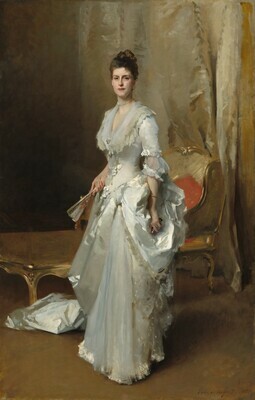 Two additional portraits from the Corcoran Collection, Frank Weston Benson’s My Daughter (1912) and Cecilia Beaux’s Sita and Sarita (c. 1921), complete the room. 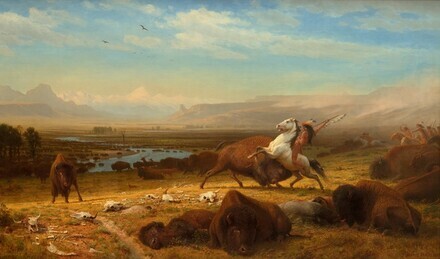 Just west of the East Garden Court, two important Western landscapes by Albert Bierstadt hang in Lobby C: Mount Corcoran (c.1876–1877) and The Last of the Buffalo (1888). A third former Corcoran work, Rembrandt Peale’s enormous portrait Washington before Yorktown (1824), occupies the vestibule near the 7th Street entrance of the West Building’s main floor.